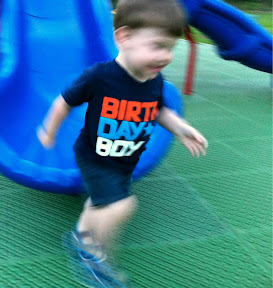 Today Luke turned two. Nobody in the neighborhood would know it as we didn't throw a massive party, yet. The big birthday party is coming on Sunday. 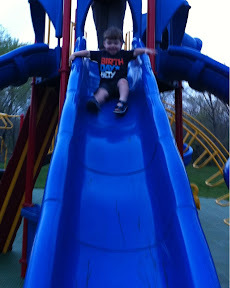 Today we took him and Alyce out to dinner, got ice cream, and played at the park. 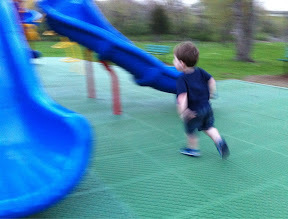 Seeing him run around at the park really puts his age into perspective. Two years ago he could just breath, eat, cry, and mess his diapers. Now well he still breathes, eats, cries, and messes his diapers but he does so much more! He can walk, run, climb, slide, sort of talk, feed himself, knows the color yellow, and the number 3. No other time in his life will he learn so much so fast. He's had a crash course in living and even though it can be frustrating at times he's doing a great job.